One thing's for sure, this movie was all over the place when it came to the action and suspense. There was rarely a dull moment. If there was, it was only to set you up for the next intense action sequence that was about to unfold. You literally feel as though you're taken on a wild adventure as the main characters travel from location to location. Each time we're given a different sense of danger, or a different enemy, or some other thrilling obstacle to watch them overcome. It was very enjoyable to see that they didn't recycle and repeat the same action scenes (such as running to a door and narrowly making it through). Without giving anything away, be on the look out for those "Cranks"! The Cranks are one of the most thrilling and creepy additions to watch. They also provide plenty of well timed jump-scares. Lastly, you can expect the many mysteries of the story to keep you both intrigued and guessing from beginning to end. Three movies that come to mind when describing this movie are The Maze Runner + Mad Max: Fury Road + this movie *SPOILER ALERT*. (Don't click if you don't like spoilers) I think it's very easy to say that this sequel is a lot better than the previous Maze Runner. 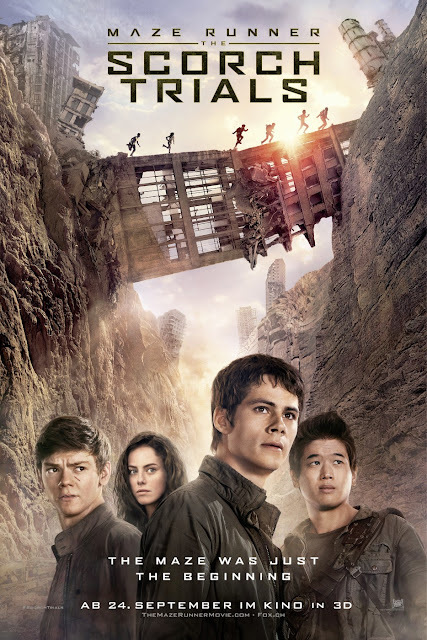 (Read my Maze Runner Review here) As I did before, I came into this movie without reading any of the Maze Runner books, and I'm certainly happy that I didn't. I've heard from others, who have read the books, that the movie was different, so I don't think it will spoil a lot for fans of the book series. Either way, The Scorch Trails is fun, entertaining, thrilling and an exciting film overall. The sequel picks up right where the last one left off, so if your memory is sketchy about what happened, or who certain people are, then a refresh won't hurt. You can either rewatch the last 30 mins of The Maze Runner, or you can just catch up by reading the wiki here. Please go watch this. I think you'll more than enjoy it. Oh and go watch the previous Maze Runner too while you're at it, if you haven't already.